The Funky Felter: Yay! I've been featured on PoshMama.com and capitolagirl.com! Yay! I've been featured on PoshMama.com and capitolagirl.com! I just wanted to share that my felted flower ring has been featured in a fiber jewelry article on both PoshMama.com and on capitolagirl.com - Yay! Thanks to capitolagirl from Etsy who found my little ring and put it in her lovely article. Check out the full article here to see what good company I am with. 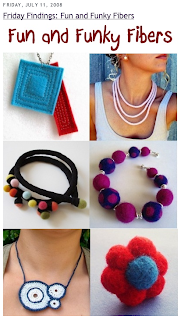 There are some great fiber art jewelry examples.